The ORBITEC 20 offers a groundbreaking approach to creating turned machining features on large, odd shaped parts, which are not conducive to normal turning operations. Large valves which require turning, threading, and tapered boring are ideal components to be processed on the ORBITEC 20. Valve bore machining can be processed in a single setup without special fixtures. Equipped with a standard 2-pallet changer, the Orbitec 20 easily integrates into Mazak’s advanced PALLETECH automation system. 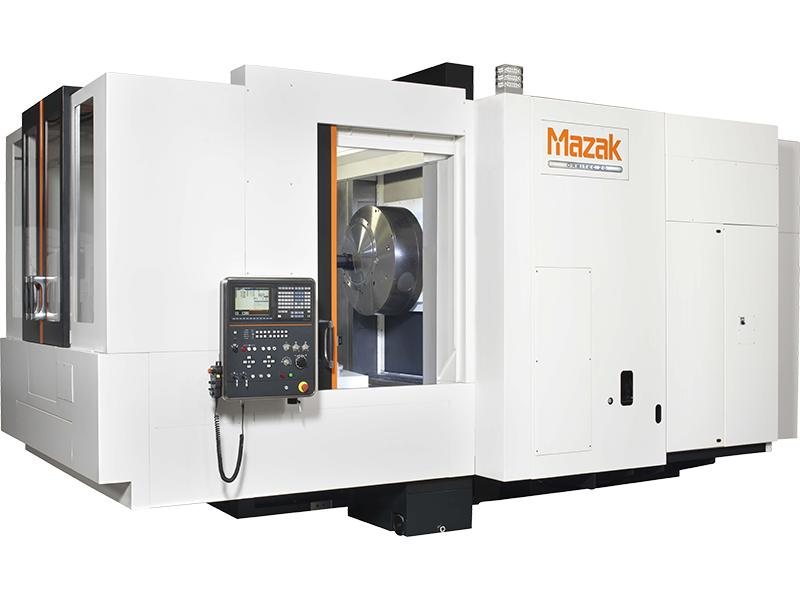 The ORBITEC 20 can then combine with Mazak HORIZONTAL CENTER NEXUS Machining Centers to create complete Done-In-One large-part manufacturing cells for lights-out operation. From welded ball valve production to jobs requiring eccentric turning operations and grooving, the part processing capabilities of the ORBITEC 20 are endless. The ORBITEC 20 excels in applications where workpieces are too big or awkward to process on conventional turning machines. The headstock generates turned features on large parts by keeping them clamped and stationary, moving only the cutting tool. As an internally counter balanced system, the ORBITEC 20’s headstock keeps tool tips facing either toward or away from the centerline of rotation while tools orbit around workpieces. This provides stable precision machining and less part interference because tools do not protrude beyond the rotating headstock when working on larger diameters. The headstock generates turned features on large parts by keeping them clamped and stationary, moving only the cutting tool. The unique system combines a circle-within-a-circle design with linearly interpolated X-axis tool movement, as opposed to a linear slide. The ORBITEC 20 provides high-precision machining for all surfaces. The ORBITEC 20 generates various finishing including generating phonographic finishes as required for flange surfaces.